My name is Michal Ruprecht and I am an 18-year-old soaring high school senior at Grosse Pointe North High School. My hometown is Grosse Pointe, Michigan. Although I was born in America I am bilingual, speaking both English and Polish. In the future I hope to become trilingual and add Spanish to my list. I have a passion for science, technology, journalism, music, baking and cooking, travel, and swimming. In this green chemistry research project, we investigated ligands, which are molecules that bind to other molecules, at the University of Detroit Mercy with Mark Benvenuto, Ph.D. and Steven Kosmas. 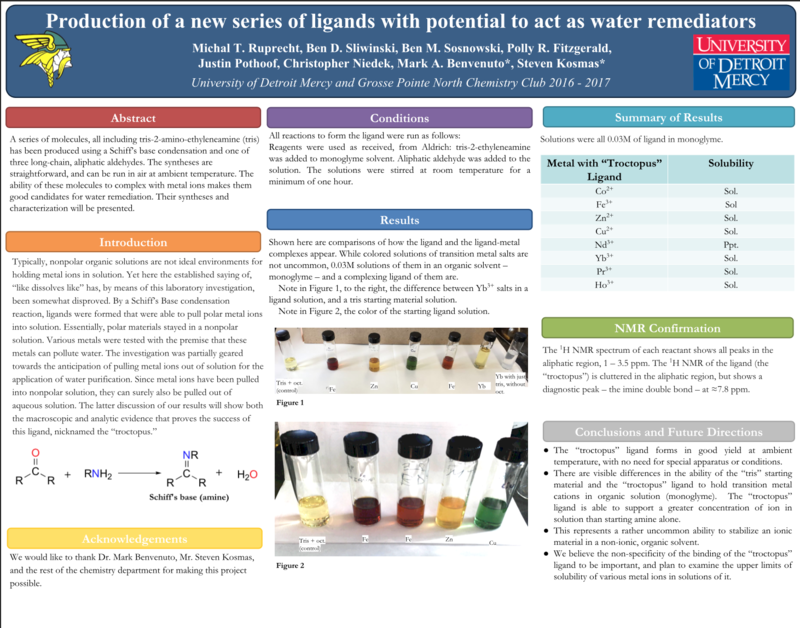 Because many Michiganders were affected by the Flint Water Crisis, my group focused on creating a ligand that could separate metal ions from aqueous solutions. Our research showed that if our ligand could pull metal ions into a nonpolar solution called monoglyme, it should be able to pull metal ions out of aqueous solution. This ligand could potentially pull metals from tainted water. After several months of data collection and analysis, we created a science poster. 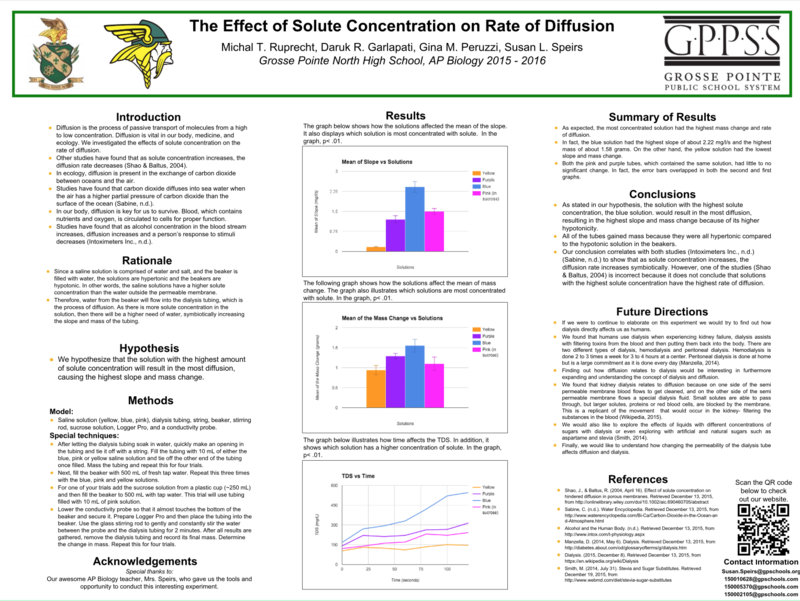 We were fortunate enough to present our poster to professors and undergraduate and graduate students at the ACS Chemistry Regional Conference in Dearborn, Michigan as the only high school group. Also, our research will be published in "Green Chemistry Education: Recent Developments," the fourth volume of "Green Chemical Processing." I am a contributing author. Click here to find more information about the book on the publisher's website. As a result, I was awarded the 2016 - 2017 Network of Educators in Science and Technology Student Award: "Promise of the Future." In addition, I received the 2017 American Chemistry Society CIBA Travel Award for Green Chemistry Research as the first high schooler recipient. I will learn more about graduate and undergraduate research and present my green chemistry research from August 19-23, 2018 at the ACS National Meeting in Boston, Massachusetts to over 11,000 chemists, teachers, and graduate and undergraduate students through the travel grant. The poster below showcases our findings. Find more information on our website. During the summer of 2017, I worked on immunology-focused research at the Wayne State University School of Medicine alongside Shunbin Xu, M.D., Ph.D. Before getting accepted to Dr. Xu’s lab, I emailed over 200 other professors. Out of the several dozen responses, I chose his lab because of my interest in the subject. I examined the role of microRNA in bacterial keratitis. MicroRNA is a newly-acknowledged level of gene expression regulation, and bacterial keratitis is a corneal infection caused by bacteria commonly affecting contact-lens wearers. I specifically examined pseudomonas aeruginosa-induced keratitis, which causes blindness and visual disabilities. I also aimed to identify new treatment strategies and therapeutic targets for the disease. During my time at Wayne State University School of Medicine, I performed DNA isolation and determined DNA concentration of mice tails using a spectrophotometer and polymerase chain reaction, found the genotype of mice with agarose gel electrophoresis, and prepared and analyzed bacterial culture plates. I used these laboratory techniques to investigate the role of the microRNA-183/96/182 cluster and ways in which it helps regulate the innate immune response to pseudomonas aeruginosa-induced keratitis infection. I also examined the potential of the anti-microRNAs, which are found in the cluster knockdown, to shield the cornea from unfavorable effects of the disease. This research could help develop new approaches to fight antibiotic-resistant bacterial infections and tumors that bypass the immune system. Because this research is ongoing, I will continue my work with Dr. Xu next summer in 2018. 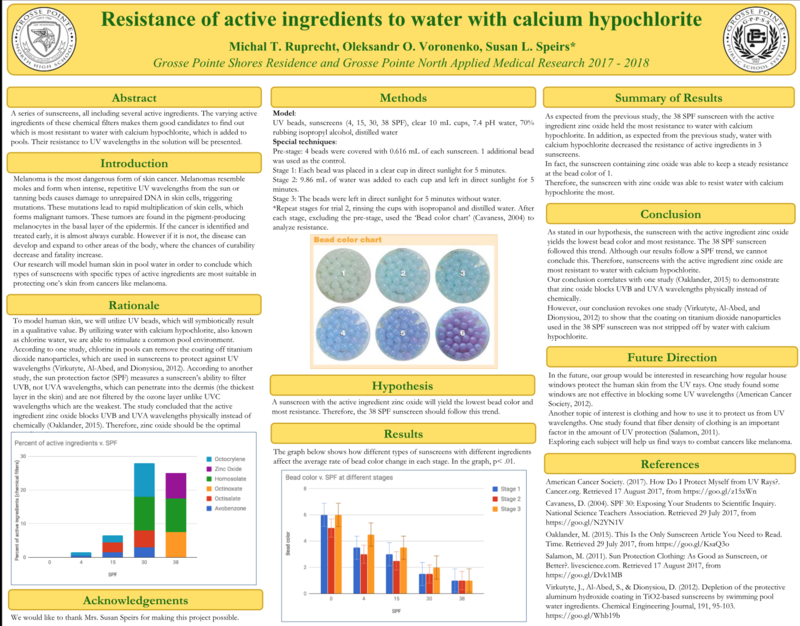 In this collaborative research project, we investigated which active ingredient would yield the most resistance to water with calcium hypochlorite, which is added to pools. Throughout the research assignment we were required to create our own procedure without any teacher guidance. The following poster showcases our findings. Click here to go to our website. As a group, we investigated how leaf color affects the rate of photosynthesis. Throughout the research assignment we were required to create our own procedure without any teacher guidance. We used different leaves, carbon dioxide probes, and Logger Pro to graph our results on a spreadsheet. The following spreadsheet and poster showcases our findings. Find more information on our website. 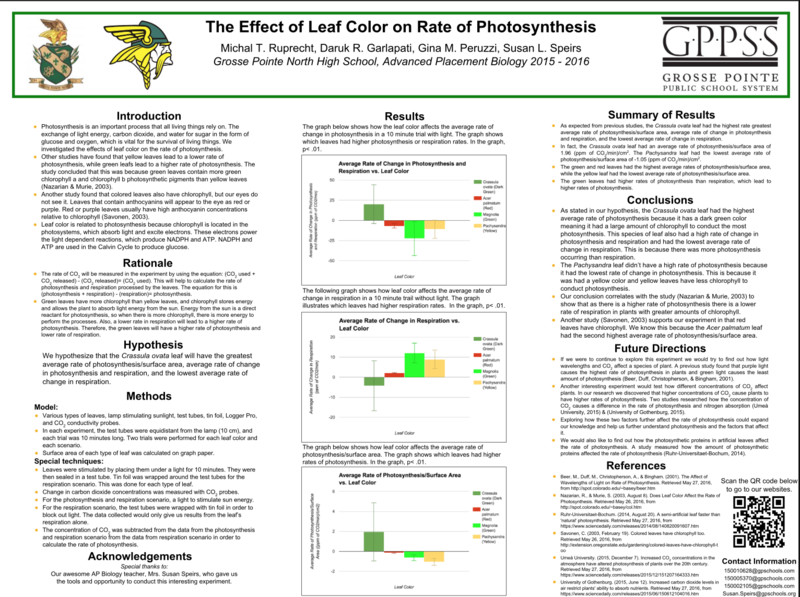 In this collaborative i-Search Project, my group and I researched the influences on photosynthesis. We focused on how the leaf, light, and carbon dioxide affect photosynthesis. Through our i-Search, we were able to learn more about the relationship between photosynthesis and chlorophyll. Click here to go to our i-Search Project. In the spreadsheet below, I created a math model using various equations in order to show populations with exponential growth and logistic growth. Through this project I was able to see how different models affect populations. In this collaborative i-Search Project, my group and I researched the causes, treatments, and effects of diabetes. In addition, we investigated how diabetes is related to obesity. Through our i-Search, we were able to learn more about the relationship between diabetes and obesity. Click here to go to our i-Search Project. As a group, we investigated how the solute concentration affects the rate of diffusion. In order to answer the question, we were given dialysis tubing and hypertonic solutions. During the experiment, we used Logger Pro to graph our results on a spreadsheet. The following poster showcases our findings. Find more information on diffusion and osmosis on our website. The following i-Search was very interesting because of its complexity and effect on many people. I researched how a stroke occurs and major risk factors of stroke. As a result, I was able to identify how external activities affect the odds of having a stroke. Click here to go to my i-Search Project. In the spreadsheet below, I created a math model using several equations in order to show a population in Hardy-Weinberg Equilibrium and another that is not in Hardy-Weinberg Equilibrium. The second population has been reduced to show a population that is not compliant with the Hardy-Weinberg Equilibrium. Through this project I was able to discover how Hardy-Weinberg Equilibrium affects a population. In the i-Search Project, I investigated how neurodegenerative diseases affect neurons and whether neurodegenerative diseases are harmful or beneficial to neurons. I focused on ALS, Parkinson's, Alzheimer's, and Huntington's disease. Through my i-Search I was able to discover the long-term affects of neurodegenerative diseases. Click here to go to my i-Search Project. Prior to the experiment, we were given pumpkin and tomato seeds from our awesome teacher, Mrs. Speirs. 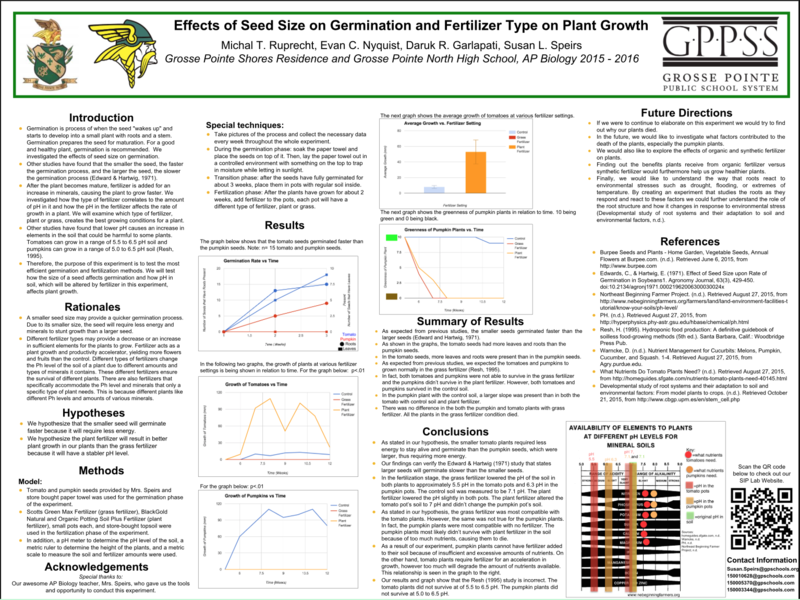 During the experiment, we investigated how seed size affects the germination rate and how the type of fertilizer affects growth. Below is our science poster explaining our findings. Find more research information on our website. ● Positively sloping GPA. Cumulative GPA of 4.21. ● Member of the National Honors Society chapter at GPN HS. ● Multiple AP courses sophomore through senior year. 10 credits in 4 years. ● Multiple science courses sophomore through senior year. 8 credits in 4 years. ● No non-academic elective courses. Solved production problems, assigned stories, designed and edited pages, wrote and edited stories, served on the Editorial Board, sold ads, and trained staff. Cleaned, watched patrons, assisted swimmers at meets, and kept up on skills and fitness. Lifesaving and CPR certified by Red Cross. Performed DNA isolation and determined DNA concentration of mice tails using spectrophotometer and PCR, and found genotype of mice with agarose gel electrophoresis. Supervised by Dr. Shunbin Xu. Investigated ligands that could pull metal ions out of aqueous solution. Presented the research project at the ACS Chemistry Regional Conference being the only high school group. Supervised by Dr. Mark Benvenuto. Restored struggling clubs, grew membership by 233% and number of projects by 300%, created social media presence and websites, and set clubs up for continued success. Presented at numerous events. Over 61 hours of volunteer tutoring K-12 students. Over 98 hours of volunteering in the Emergency Department and shadowing physicians and PAs in seven specialities. Led team to design, construct, and successfully launch model rocket to 800 feet and return two uncracked raw hen eggs using an Aerotech engine. Led team of students to prepare for and took the local exam at the University of Michigan-Dearborn. Played advanced music along with professional musicians and participated in seasonal Grosse Pointe Symphony Orchestra Concerts. Performed with GPN HS Symphony Orchestra freshman year. Assisted coaches with time management by ushering young swimmers during meets. ● Letter of Recognition from the United States Secretary of Education Betsy DeVos. ● Letter of Recognition from the State of Michigan Executive Office and Michigan Governor Rick Snyder. ● Letter of Recognition from the United States Senate and Michigan Senator Debbie Stabenow. ● North Pointe Newspaper volume 50, issue 11, page 5. ● North Pointe Newspaper volume 50, issue 10, pages 1, 2. ● Grosse Pointe News volume 78, issue 51, page 9A. ● The ACS Green Chemistry Institute Website. ● Grosse Pointe Times Newspaper volume 36, issue 50, pages 1, 22A. ● University of Detroit Mercy - College of Engineering & Science Website. ● Grosse Pointe Times Website. 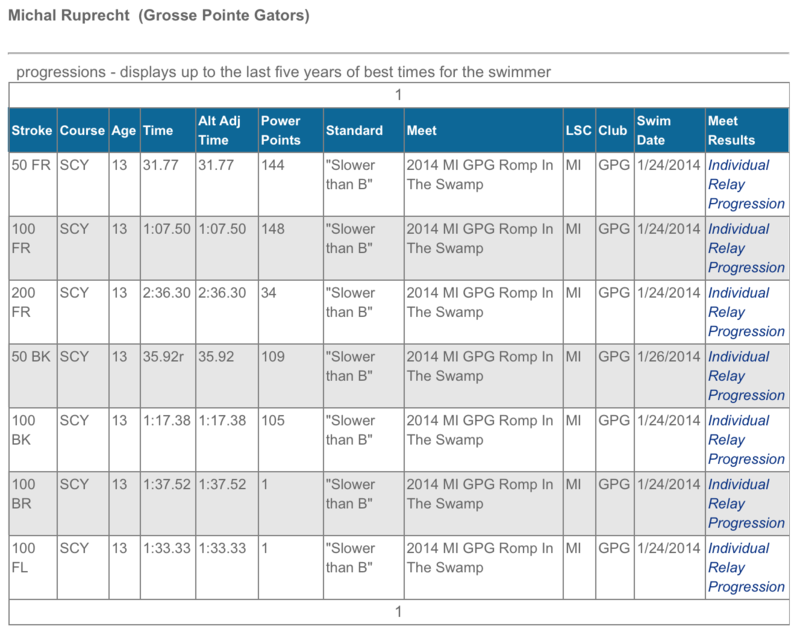 ● Grosse Pointe Patch Website. ● Grosse Pointe News volume 79, issue 12, page 15A. ● 48th Central Regional CERM Meeting in Dearborn pamphlet, page 129. ● North Pointe Newspaper volume 49, issue 14, page 2. ● North Pointe Newspaper volume 50, issue 7, pages 1, 4. ● North Pointe Now Website. ● North Pointe Newspaper volume 49, issue 4, page 3. ● North Pointe Newspaper volume 50, issue 5, page 2. 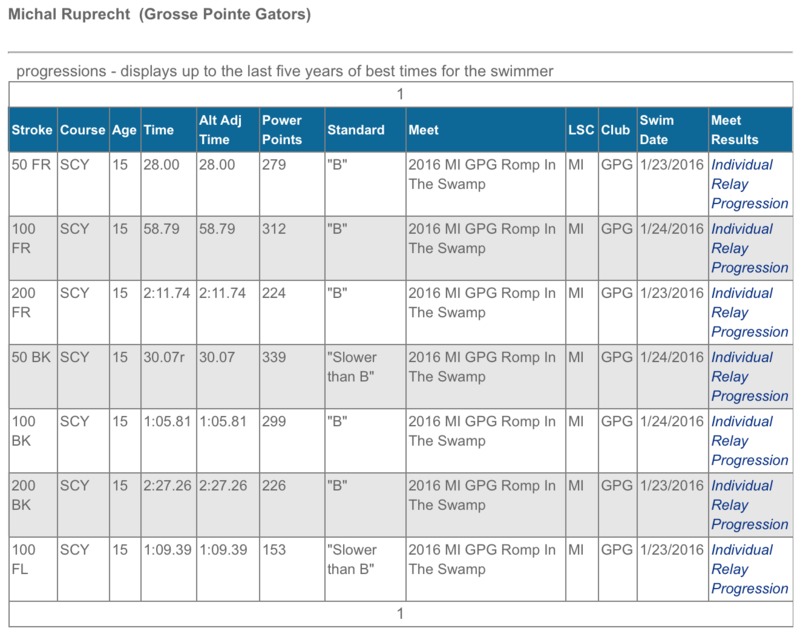 ● Grosse Pointe North High School Athletics Website. ● North Pointe Newspaper volume 47, issue 4, pages 1, 5.